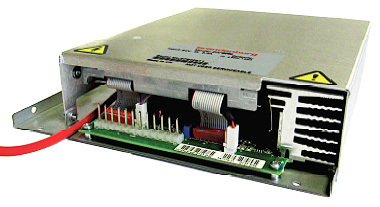 This range of high performance 100W high voltage power supplies has been specifically designed for applications where a remotely switchable polarity is required. This compact converter module employs solid state switching techniques allowing for fast polarity reversal whilst maintaining excellent line and load regulation. These modules are designed to operate from a dc supply of 24V (nominal) and provide an accurately controlled high voltage output. The use of high stability components within the feedback system ensures a low temperature coefficient and good long & short term drift making the HC series ideal for use in MALDI time of flight mass spectrometry equipment with pulsed load requirements. The output voltage may be controlled from 50V to maximum (10 or 20kV) of either polarity by means of an external control voltage (0 to +10V). Monitoring of output voltage & current provided. input should use pins 2 & 4 in parallel and pins 5 & 10 in parallel. <10ppm for a 1V change in input voltage. <10ppm for zero to full load. 8) Negative = High (>2.5V) or open circuit. Positive = Low (<0.8V). <250mS. Between maximum rated output to maximum rated output of the opposite polarity. Low (<0.8V) = high voltage OFF. High (>4V or open circuit) = high voltage ON (10k pull-up to +5V). Zero to +10V ±2% for zero to maximum (Z= 10k).